Robolab is equipped with all the advanced technologies which are used in industries and it offers training courses consistent with the latest curricula and the industry requirements. They function as the perfect platform for its users (students and teachers) to explore, learn, build and share their ideas. They are on the mission to provide innovative and interactive training by industry experts which can empower the trainees to manage the Robolab in future. They have standard Robolab offerings and will also customize as per the needs of the institute. Amol is a roboticist, he has deep experience in designing and manufacturing of complex and task specific industrial robots. He has a profound knowledge of educational and defense robots and is specialized in digital image processing, embedded programming, design analysis and optimization. With his entrepreneurial, management and technical skills, he plays an important role in shaping a great technology company. Pratik’s right mix of technology and business skills forms a unique blend and comes in as a great positive feature to an innovative company. He has earned experience in technology consulting and solutions in the area of business analytics, analysis and consulting space. He is well versed in executing technology projects and has deep knowledge of various industry methodologies. He comes with unique ideas of working with large corporations majorly in the space of sales & marketing domains. With business development background and technical education, he has the fitting understanding on extensive areas of sciences. How was the journey so far with Robolab? We started working out the business model for Robolab in May 2013. Initially, we concentrated on cracking our first deal with Gurunanak Institutions, Hyderabad. Since then we didn’t look back, it gave us the necessary momentum and the ball kept rolling. We officially got incorporated on Friday, 13 September 2013. In last 3 years, we have reached 12 key institutions spread across 7 states in India. We are also associated with the research and development team (ThinkTank) of Indian Military and giving technical solutions for the improvement of the Indian Military’s performance and safety. It took us nearly 5 months to crack our first deal. Our team met several institutions but most of them rejected us for not having experience. We left our comfort zone and started approaching progressively to many early stage institutions all over India. The pool was large so we had to target somewhere initially, so we chose Andhra Pradesh and began approaching Professors and HoD’s of top colleges. After almost 2 months from starting this exercise, we succeeded in breaking the ice. To convince our first institution, we first met professors, then HoD’s, then Research and Development Head, then Deputy Director and then finally the Director, that too in just one day. We were exhausted with repeated presentations and all the talking but we were ready to do whatever it takes to convert them. Against all odds we got the order and successfully established the Robolab and delivered training at their campus. The management as well as trainees were well satisfied and recommended us to their counterparts. What is the biggest challenge you faced as an entrepreneur while establishing your start-up? 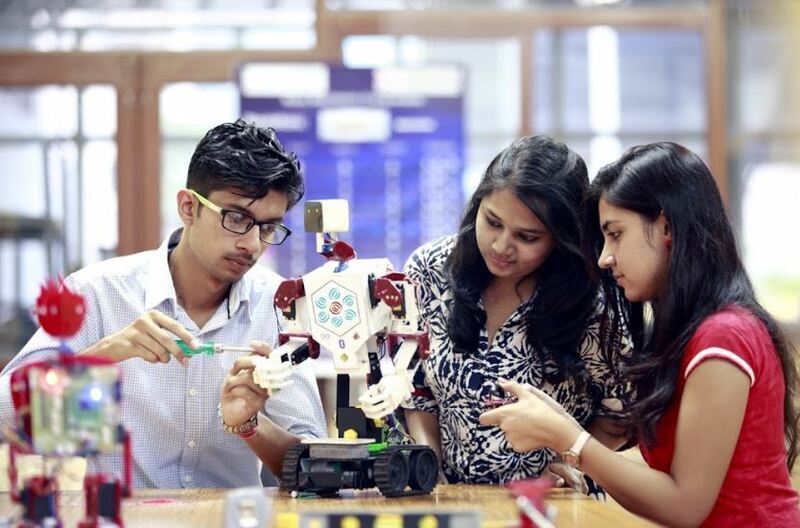 Even though everyone we meet likes the idea of having Robolab at their campus, but the final decision takes some time which could have been properly utilized for the betterment of the students. We overcame it by utilizing the technology to the maximum possibility. Most of the times decision makers want to clarify things face to face and we have started using the video conferencing for addressing such meetings. The most important part of the company are the customers and your team, both work hand in hand. You have to maintain a perfect balance between your customers as well as your team. Look at the bigger picture; But don’t lose the tiny details. The answer is always NO if you never ask. How was your experience in bootstrapping your start-up? Being bootstrapped keeps you on your toes. You are the one responsible for whatever happens to you and your company. There are some who are trying to establish a part of the complete solution that we are offering. The reason for existence for those companies is completely different and we do not consider them as our direct competitors. We have the first mover advantage not only because we were the first but also because we are giving the best possible solution in the market. Robotics solutions for industries, defense, domestic and other socio-economic problems. You must be shapeless and formless like water. When you pour water in a cup, it becomes the cup. When you pour water in a bottle, it becomes the bottle. When you pour water in a teapot, it becomes the teapot. Water can drip and it can crash. Become like water my friend. Start Small, Start Quick and Scale Fast.